In 2012, Vinz, a young Frenchman, thought it would be great if his friends in Reading could join him in celebrating Bastille Day and also gain a better understanding of French culture. 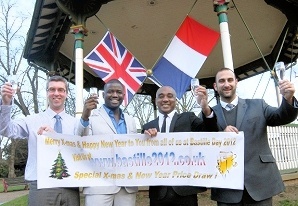 So, Bastille Day 2012 was born out of this idea. But with so little time available, the race was on to sell the idea to the people of Reading. Vinz enlisted the help of two French friends: Frédéric and Boubacar. With Eric as a forth addition the follwoing year, the nickname 'The Four Frogs' was born within the local community. Ever since, they set to work to bring the Bastille Day Festival to Reading with the help of many other people, including Cathering and Ian. The rest, as they say, is history, and with generous support and help from the successive Mayors of Reading and our local sponsors, more than 2,500 people on average have attended Bastille Day Reading making it a great success despite the famously unpredicatble English weather.